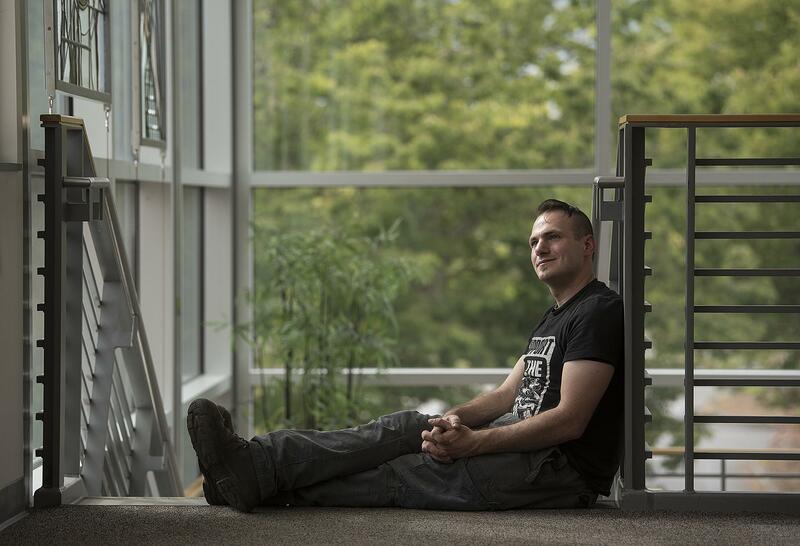 VANCOUVER – Jonathan Dutson long dreamed of moving to the Pacific Northwest, where its lush greenery offered a respite from the scorching Arizona sun he grew up beneath. But Dutson was looking as much for a new home as he was looking for an escape. Dutson was one of 700 who walked in Clark College’s graduation on Thursday at the Sunlight Supply Amphitheater in Ridgefield. Dutson graduated with a degree in machining technology, and is working at Howser Steel in Portland. But the journey here for the 32-year-old was long. Dutson suffered years of sexual abuse by a relative as a child. His abuser was never prosecuted, and Dutson said he felt shamed into not talking about what he was experiencing at home for years. As a child at school, meanwhile, he was struggling and frequently got into fights. But Dutson always looked forward. After a trip to the Pacific Northwest when he was 13, he knew he’d end up in the region. “I’ve always been a dreamer,” he said. After years of working what he described as dead-end jobs in Arizona and the death of a childhood friend, Dutson packed his bags in 2014 and moved to the area. “He’s really vibrant and full of life,” Lusk said. In addition to his studies, Dutson became a student ambassador at the campus, greeting visitors to Gaiser Hall and leading tours for prospective students. Amy Tam, a recruitment and enrollment specialist at the college, was Dutson’s supervisor. Still, some days are harder than others. Dutson has post-traumatic stress disorder, making it difficult to “get out of bed and do normal stuff” some days, he said. But Dutson said he continues to find fuel in his dreams, ranging from finally earning a college degree, to earning his pilot’s license, and becoming a SCUBA instructor. “I just have this drive to do certain things,” he said. And in recent years, Dutson has opened up about his past. He said he hopes to be an advocate for survivors of abuse someday. Tobias Peterson, a professor in the English department, was Dutson’s technical writing teacher. Dutson was always engaged and active in class, Peterson said. But Peterson didn’t know much about Dutson’s past until he heard him speak at a Board of Trustees meeting about a year ago where he was recognized. Dutson described some of the abuse he suffered as a child, leaving Peterson surprised, but more impressed by his student. Published: June 24, 2018, 11:30 a.m.